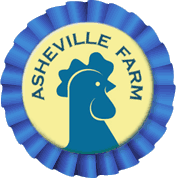 Chickens, Guinea Fowl, Goats & Sheep Running Free in Asheville, NC! Located just five miles north of beautiful Asheville, North Carolina, Asheville Farm is home to a pampered, ever-changing collection of Icelandic sheep, dairy goats, free-range chickens and Guinea fowl local, farm-fresh eggs and a small but growing orchard of organically-grown peaches, plums, apples, blueberries and lots of tomatoes, peppers, and other fresh vegetables from mom's garden. While we are not currently selling any products to the public or hosting farm tours, you may enjoy following along as our farm has evolved over the years. Just wander over to the farm photos section or the sheep shearing day before-and-after pictures. - what's the best way to medicate a sick pet chicken? - where can we buy goat meat for the holiday? - who in the area may need a farm intern for the summer? - how do you like living in Asheville? 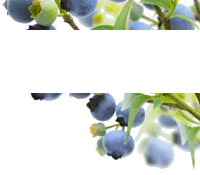 - why isn't it possible to buy raw milk in North Carolina? ...we try to reply to email inquiries as much as time permits. 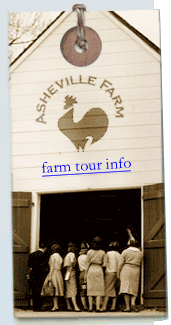 Thank you for your interest in Asheville Farm!